In 2004, Uhing added the non-contact FA flange detecting system for rolling ring drives to its product range. This economically priced solution that automatically corrects the reversal points of rolling ring traversing gears relieves the employees in production companies of manual adjustment work and thus reduces time requirements and costs. Uhing now launches the second generation of this product – equipped with new sensor technology and expanded function range. 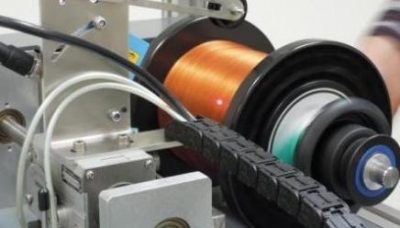 It often happens that a new spool is not in exactly the same position as the previous one although it has the same width, or that the spools have wide width tolerances. "In such cases, the reversal points of the rolling ring drive must be adjusted accordingly," explains Wolfgang Weber, Uhing’s Managing Marketing Director. "This always takes some time and distracts from other tasks that must be interrupted for this action." The non-contact FA flange detecting system corrects the reversal point of the traversing system automatically. This function soon made the FA an indispensable device for companies whose products have to be wound – in particular wire or cable producing companies. During the years, the non-contact FA flange scanning system had undergone several technical development stages leading to today's second generation. This entirely new system features an expanded function range, optimised application and is customer-friendly. A new feature is the product’s ability to automatically detect the width of spools and the flange type – straight or other than 90 degrees. The flange detecting system adapts to the new position and width if a spool with a different width is used after spool change. The most significant novelty of the FA II is the laser sensor. It replaces the previously applied light barrier detection system. The sensor detecting the flange is mounted on the traversing system. 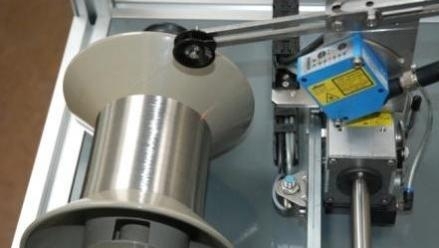 Within a specified range, it captures the offset between the surface of the spool core and the maximum permissible height stored in the system software and saves this value as reference offset for each new layer. During winding, the flange detecting system continuously measures the respective offset and compares it with the reference offset. A reversal is triggered when the permissible height deviation also stored in the system is exceeded. A display indicates the measured height or the permissible height deviation. "The flange detecting system was specially developed for pneumatically reversed rolling ring drives. But after a check, it can also be mounted on other reversible traversing systems," says Weber. No signals from the machine are required for the system to work reliably. Resetting the measurement, however, is possible with the floating start signal of the machine or an alternative pushbutton on the controller. The signals "flange detected", "counter clockwise", "clockwise", and "error" can be provided for pneumatic or electric connection. Like the first product generation, the FA II convinces with a low purchase price and efficient operation. Compared to the previous generation, it is even easier to operate. No previous knowledge is required. The winding results are convincing: The application of the non-contact flange detecting system ensures flawless winding results. The sensor technology used in the FA II is robust and nearly maintenance-free. The sensor should only be protected from dust. For this purpose, a protective enclosure with compressed air connection and restrictor is offered as option. To protect the sensor from dust ingress, it is sufficient to blow a very small volume of air into the enclosure. An oil separator may be required if there is much oil in the compressed air. The system has been designed for laying round material with diameters of 0.1 to 2.0 mm on cylindrical spools. Custom dimensions are possible after consultation. Spools with flange diameters not more than 220 mm larger than the spool core can be used. After consultation with the manufacturer, the non-contact flange detecting system can be configured to suit other dimensions as well. When using several spools, the smallest core diameter and the largest flange diameter apply. The FA II flange detecting system can handle rectangular or conical flanges up to an angle of 40°; bulging flanges are compensated for. The traversing system must be mounted parallel to the spool axis. 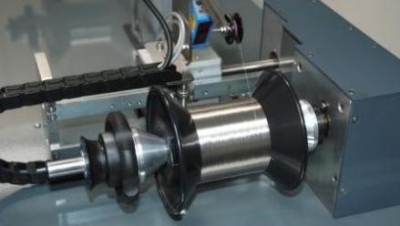 For very slow winding speeds, the axial run-out of the shaft carrying the spool should not be smaller than the smallest diameter of the material to wind. The FA II withstands high environmental strain. It can be operated at temperatures of -10° to 40° C and a maximum relative humidity of 95%. The FA II flange detecting system is made of tried and tested industry components ensuring a high quality and long-term spare parts supplies. The product has a modular design. In addition to the protective sensor enclosure with pneumatic hose, restrictor and fastening material, we also offer a pneumatic kit, consisting of fast-action valve, mounting bracket, connecting cables and hoses as well as a guide system comprising components of the Uhing GS System. "We are striving at offering optional components for all practical applications," says Wolfgang Weber." The FA II flange detecting system last but not least reflects the customer commitment that has been Uhing’s driving force for many decades.